Designed by Patti Linnett and Debbie Collette, 2009. 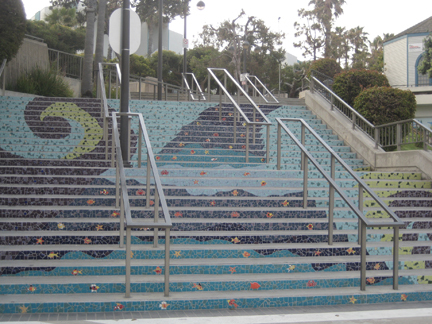 Mosaics cover the stairs at King Harbor, Torrance/Redondo Beach, California. This is the first project under the auspices of the newly formed Public Art Commission of Redondo Beach. The budget was $4,000. 831 N. Harbor Drive, Redondo Beach, California. Below are excerpts from an article which appeared in the Daily Breeze newspaper, Kristin S. Agostoni, "Mosaic artwork makes steps lively in Redondo Beach" November 16, 2009. In four months, with more than 50 volunteers and thousands of tiny pieces of tile, two Redondo Beach women helped turn a set of ordinary cement steps into a work of art.... The once-dull faces of the steps are now covered with colorful chips of ceramic tile, creating images of rolling waves, crabs, fish and other sea features....community members and fellow artists with the Redondo Beach Art Group - of which [Linnett] and Collette are members - pitched in at least 1,000 volunteer hours.